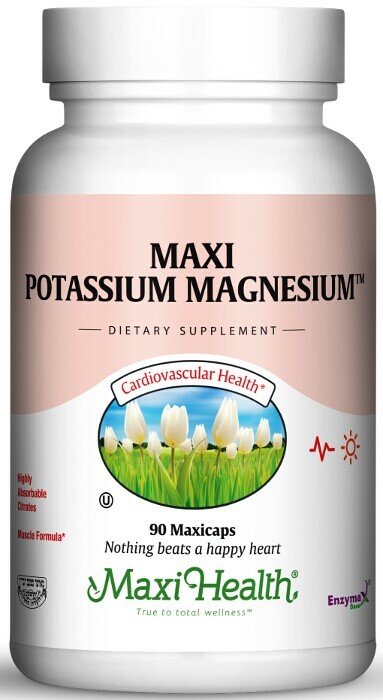 With Maxi Potassium Magnesium™ you can take one supplement and get two of the most important minerals. Magnesium supports muscle and nerve functions, calcium absorption, and supports energy production on the cellular level. Potassium is an electrolyte, conducting electricity in the body just as with sodium, chloride, calcium, and magnesium. In its role as a regulator, potassium and sodium work together to establish an electrical potential across cells. This allows the transport of nutrition and absorption of water. Make the most of your supplementation regimen with Maxi Potassium Magnesium™! Other Ingredients: Vegetable cellulose, rice flour, magnesium stearate, Enzymax® (calcium carbonate, bromelain, papain, lipase, amylase, protease, silica).